A company with history like Indian motorcycles deserves special saddlebags to go with them. Viking Bags offers specially tailored Indian saddlebags just for these bikes. They’re of the highest quality and come in many different designs and variations. Whether you need a shock cut out to accommodate your bike or want the locking feature. 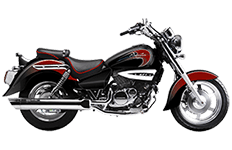 There are plenty of suitable Indian saddlebags that’ll fit the requirements. Our years of product research and development will reassure you that our high quality saddlebags won’t fail or fade. Add our award winning saddlebags to your bike now. For every rider there is a perfect set of saddlebags. We understand that every motorcyclist has his or her own style, and we have gathered the world's best luggage in order to cater to everyone. The Hyosung saddlebags collection is special in that it truly brings sophisticated styling together with affordable construction in order to provide riders with the ultimate set of riding gear. Now you can own a set of saddlebags from this exquisite collection of saddlebags, no matter which model of the Hyosung motorcycle brand you rep whether it is GV250 Aquila or any other. Take a look inside of our collection of saddlebags here, and you'll see the difference in specs and what drives us to deliver the best products on the market. There comes a time in which you must ask yourself why you ride and how far you're willing to go. With the Hyosung saddlebags by your side, you no longer have to worry about the answer to those questions, because anything is possible with the right amount of storage space and comfortable design aesthetics by your side. Made from high-quality leathers or hardened fiberglass, Viking created these bags to withstand the pressures of the open road, the harmful nature of the weather and the abuse that years of riding can put on a saddlebag. Riders will fall in love with the exterior designing, as these saddlebags work well to fit in with the aesthetic theme of your motorcycle's stock appearance. Owning multiple pairs of Hyosung bags might make it easier for you to travel for the day's ride. We offer a variety of hardware kits to make that possible, too. Say you want to switch out your large saddlebags with a pair of smaller saddlebags, because you'll only be riding to and from work for the next week. A quick disconnect system will not only work with these multiple pairs of saddlebags, it will also make it easier for you to remove the first pair and mount the second pair. Don't waste your time fooling with difficult removal systems. Set up the saddlebags and be on your way! Key features such as chrome polished buckles and interior pockets give the Hyosung saddlebags a distinctive mark when compared with other luggage compartments from this price point. Yes, Viking has really outdone themselves with the careful attention to detail, the heavy duty stitching and the exquisite mounting capabilities. In fact, every purchase of this saddlebag series comes with a free kit of hardware and installation instructions, a $100 value perfectly matched for your new saddlebags. Additionally, Viking made the mounting instructions rather easy for everyone, so it doesn't matter if you're a weathered mechanic or a new rider. Complete with a locking mechanism and personal key system, the Hyosung saddlebags thrive off of protecting your goods for any thieves that may be watching you. Whether you're at home, at work or on the road, you don't have to worry about your goods being stolen when they're stowed away properly. This innovative Viking feature is exclusive to the brand, and the Hyosung collection of saddlebags becomes your greatest asset for protection. With the rest of Viking's unique features at your finger tips, you know you're getting a luggage solution you can trust. We guarantee it. Just like the rest of our motorcycle luggage collections, buyers can rest easy knowing that the saddlebags for Hyosung come with a 30-day money back guarantee. Try our bags out and if you aren't completely satisfied with the way they fit your motorcycle, we'll offer you a full refund. Of course, we can also help you find a better Hyosung saddlebag match for your particular bike, because we want you to experience the difference in high-quality luggage. That's our promise to you, so browse through our inventory of Hyosung saddlebags today!